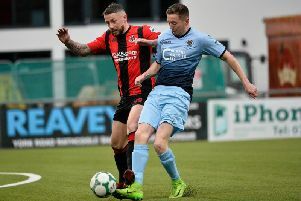 Caolan Loughran’s second-half double left Niall Currie unbeaten in three Bluefin Sport Championship games against his former club and Carrick Rangers four points clear in runners-up spot over Portadown entering the final five games. Portadown, having lost the two previous meetings, appeared on course for a significant boost in the chase to close the overall gap as goals by Martin Bradley and Adam Salley opened up a two-goal gap at Shamrock Park. Carrick Rangers manager Niall Currie. However, Loughran and Carrick showed spirit to finish with a share of the spoils. Early evidence of Portadown’s attacking intent in pursuit of closing the gap arrived across the early exchanges, with a low cross by Chris Lavery flashing across the face of goal but Loughran on hand to cut out the delivery. Carrick’s response featured neat footwork on the left by Ryan Strain to engineer space for a cross which Craig McMillen fed back to Lloyd Anderson but he could only scoop his shot over the bar from the edge of the area. The visitors’ next significant attack forced Ports goalkeeper Declan Dunne to get a low out-stretched glove on to Gerard Kelly’s sidefoot shot to push it wide after a neat exchange between the Carrick player and Anderson around the box. The impressive Luke Wilson slipped a sidefoot pass to pick out the run in from the right by Salley but the subsequent shot from a tight angle proved too high. Portadown striker Aaron Duke’s greatest first-half threat came from his deep throw-ins - with one leading to the opening goal just before the half-hour mark. His searching throw-in from the left created problems in the packed penalty area and the ball glanced off a Carrick head for Bradley to pop up at the back post and break the deadlock. Carrick hit back with a rapid response that had Portadown on the backfoot but Gregg Hall slid to cut out one cross then reacted first to block the shot off the rebound. A slick break by the Ports off a Carrick throw-in sparked home hopes of a second goal as Lavery found Bradley and his angled ball into the path of the supporting Jerry Thompson was whipped into the danger area. Duke’s flick dropped to Bradley but the volley lacked accuracy. However, Portadown cemented control inside the first five minutes of the second half with a well-worked move to cut open the Carrick backline. Duke picked out Bradley wide on the left and his low ball left Carrick exposed, with Salley racing in to tuck home. The next talking point came from Portadown as Bradley’s delightful flick released Salley just inside the Carrick half and he raced goalwards but the final shot lacked power. Another opening arrived moments later but Aaron Hogg raced out quickly to smother Lavery’s shot. Portadown continued to push in pursuit of a third and Hall intercepted one clearance then attacked to pick up Duke’s pass but the low effort drifted the wrong side of the upright. Carrick, however, managed to set up a tense finale by cutting the gap on 77 minutes when Stewart Nixon’s cross was nodded down and in from a few yards by Loughran. And, in injury-time, Loughran had the final say with another header to complete yet another spirited fightback by Currie’s Carrick. PORTADOWN: Dunne, Finnegan, Larkin, Lavery (McCallum, 88), Salley, Duke (Carmichael, 83), Hall, Thompson, Bradley (Mackle, 63), Wilson, McKenna. Subs (not used): Carson, Tipton. CARRICK RANGERS: Hogg, Chapman, Neale, Surgenor, Rodgers (Coyle, 51), Loughran, McMillen (McDermott, 64), Anderson, Strain (Smith, 51), Kelly, Nixon. Subs (not used): Adamczyk, McCauley.